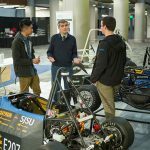 While automotive engineers and designers wowed audiences with the “future of drive,” San Jose State University engineering students impressed visitors with their own innovative built-from-scratch vehicle designs at the SV Auto Show Jan. 4-7. 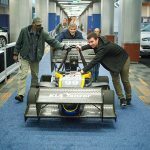 The students displayed Formula One cars, a quadricycle, a golf cart run on solar power and an electric race car. The San Jose Mercury News highlighted the student cars in an article.